Lufia II might not be as recognizable as some of the bigger name Super Nintendo RPGs, but that doesn't mean it packs any less of a punch. If it's one thing the Super Nintendo System had a lot of, it was RPGs. Some were good, some were bad, and some were outstanding. 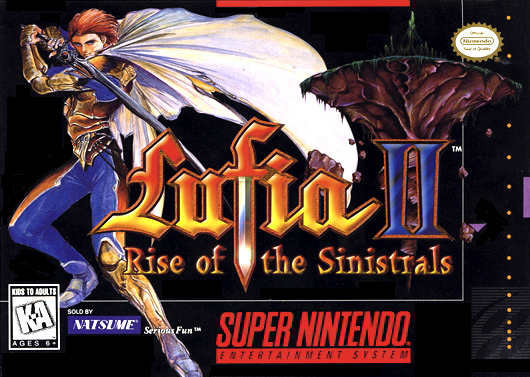 Lufia II: Rise of the Sinistrals would fall into the latter category. Not only does it offer an amazing turn-based combat system, but it also sports one of the all-time great RPG storylines of the 16-bit era - or any other era for that matter. Couple that with an excellent soundtrack and you have a Super Nintendo RPG that simply should not be missed. 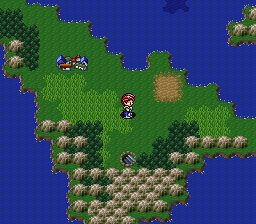 You move around in Lufia 2 via the typical world map. While traveling on the world map, your party is vulnerable to random enemy encounters. It's here that you can take part in battles where you'll gain valuable experience and gold. This allows you to level your characters up, not to mention gain money that can be used to purchase better armor, weapons, and other useful items. You're also going to be spending a lot of your time in many of the game's various dungeons. While exploring these dungeons is fairly standard, there will be times when you'll enter rooms that will require you to solve various puzzles. Some are fairly simple in design, while others can be quite tricky. 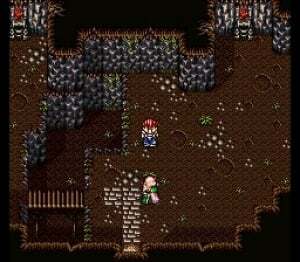 It's these puzzles that offer up a very unique twist to the traditional RPG game play system used in Lufia II. Another unique aspect of Lufia II is the ability to find and raise a capsule monster. There are 7 different monsters hidden throughout the game and once located, they will remain in your party indefinitely. You can even level them up by feeding them certain items and equipment. These capsule monsters can evolve up to a fifth and final form and can prove to be quite the capable fighting companion if raised correctly. 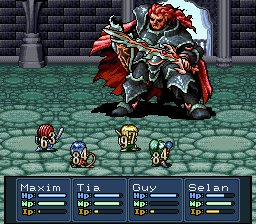 Very few turn-based RPGs play as efficiently or with as much variety as Lufia II's outstanding combat system. For the most part the combat system is your standard turn-based affair, with a slight twist. As you do battle with enemies, your IP guage begins to fill up. If you're lucky enough to find or buy certain weapons that contain IP abilities, as your gauge fills up your weapons will gain special abilities that can be used to inflict devastating attacks on enemies. Using these special abilities uses up your valuable gauge so you have to pick and choose the best times to make use of them. It really adds a great deal of playability and strategy to an already speedy and playable combat system. It also requires you to pay attention when purchasing your weapons and armor as sometimes the most powerful weapons don't contain these special IP Abilities. Although you might find some Super NES games that sport slightly higher quality visuals than those found in Lufia II you certainly won't find much to complain about either. It makes good use of the Super Nintendo's large color palette to produce detailed towns and landscapes throughout the game. Every dungeon has a unique look and feel to it, and towns - although fairly standard for the most part - do take on more personality and charm later on in the game. Truthfully, the only part of the game that tends to look a little bland is the combat scenes. There's not a lot of animation in the monsters you fight, and although the backgrounds generally fit in with the area in which your characters are currently doing battle, they just have a very basic 8-bit look to them at times. So while Lufia 2 might be a small step down from such Super Nintendo visual greats as Chrono Trigger or Super Mario RPG, it's certainly no slouch in the graphics department either. While Square and Enix normally held the monopoly on most of the really great Super Nintendo RPG soundtracks, the composers of Lufia II's musical score truly outdid themselves. The soundtrack in Lufia 2 is nothing short of amazing, and other than possibly Chrono Trigger or Final Fantasy VI, it's easily one of the best RPG soundtracks to come out of the 16-bit era. Beautifully orchestrated music (somewhat reminiscent of Seiken Densetsu 3) is strung throughout the game and it just seems to get better the farther into the game you get. With such great variety and plenty of tunes to go around, you'd be hard-pressed to find a much better soundtrack in a non-CD based video game. Lufia II is easily one of the top tier RPGs for the Super Nintendo console and a game that is challenging, humorous, and an overall joy to play. When you combine the game's unique visual stylings, the efficient turn-based combat system and the beautifully orchestrated soundtrack, you get one absolutely unforgettable RPG experience. Before we all got spoiled with the full-motion video and millions of polygons per second of today's epic RPGs, we had games like Lufia II that had a lot more to them than flashy visual effects and voice-overs. The Super Nintendo is widely considered to be an RPG fan's dream console and with games like Lufia II, it's easy to understand why. This is a fantastic game to such a degree that I'd say games like it aren't made anymore, but still: Terranigma deserves an even better rating. This game is beyond awesome, now all we need is to get it actually released on VC. Nice review! This really is a fantastic game, and had so many cool ideas way ahead of it's time plotwise that still don't happen very often these days.. I'd name the big romantic one, but it'd be a spoiler for when this inevitably hits the VC, and anyone who has played it knows what I'm talking about anyway. Definitely one of top 'Not-Square' RPGs of the SNES, along with Breath of Fire 2 (despite its flaws). For a standard-sounding RPG, this is given a great rating! So many good RPGs I've never played! And I need the VC! I expected a 7....no joke. This game isnt all that. I ranked the Top 200 RPGs I own about a year ago and this one was #3, behind only Chrono Trigger and Terranigma. One of my all-time favorite RPG story lines and the most efficient turn-based combat engine I've ever played. Is Lufia II a remake of the first game? Some of those screens look very similar. No, Lufia II is actually a prequel to the first game. Great, another awesome RPG on SNES that will probably never come to Virtual Console! I never played this one but I have Lufia: Runes of Lore on GBA. I picked it up on a whim so I didn't even know there was a sequel! Are the stories connected? I would love to play this but I guess I shouldn't hold my breath! What? Why will this 'probably never come out on virtual console'? It's made by Natsume, they're still alive and kicking and already have VC stuff. Or is it just the new hip fad with internet kids these days to be as needlessly negative as possible? When I said it would probably never come to Virtual Console I was just refering to the snail-pace at which Nintendo actually puts games out on Virtual Console. Judging by the current trickle of games(1 VC game a week), I don't feel too optimistic about us getting this game any time soon. I hope I'm wrong though! Is this available on VC? And does it play like Lufia Legends on GBA (which I have)? This is not yet available on the VC and it's MUCH better than Lufia: Ruins of Lore. Lufia II features more moving around on a world map and leveling up that way. A much more well-rounded RPG experience. I wasn't very impressed with Lufia: Ruins of Lore and Lufia: Legend Returns on GBC..
Bring em all the VC I say! Lufia II is by FAR the best of the four-game series. It's also not really standard at all. In fact, I notice a complete and utter lack of a MENTION of capsule monsters in the review! Foomie would be so sad...oh, and all those other guys, too. How could you leave that out, Corbie? I thought the capsule monster aspect felt a bit "tacked on" at times. They didn't make it very important at all, almost like an afterthought. seriously...lack of mentioned capsule monsters = glaring omission....and no, the Ruins of Lore Lufia game, while it tried to style itself after Lufia 2, was a vastly subpar game...battle pacing was abysmal and it took effort to keep playing....Everything about the implementation of Lufia 2 is better--presentation, STORYLINE, even graphics to a degree, MUUUUUSIC! One of the few games I feel deserves a 10...there just isn't anything not to like about Lufia 2. The reason I got into emulation as a kid was to play this game. The reason I got into game development was the completion of this game. Puzzles are beyond bonus. @Corbie: On this point, we differ greatly. It's a cool system, and it especially matters once you reach the 100-floor randomized dungeon! Really, whether it's mostly important or not, it's still pretty cool, and worth SOME mention in the review! EDIT: There, you see? As I typed this post, Swerd_Murd came along and agreed with me. So there! I love this game. VC release please Nintendo! Next up on the Lufia II campaign: Somehow get it on VC. Seems like Natsume has only put one or two games on VC so far and more or less given up already. They've got to have more to put up than THAT (like Lufia, obviously)! Never even heard of this until I saw this review. Nintendo really needs to bring out more SNES on the VC. This game will always hold a special place in my heart. Great review, it moved me to nostalgic tears. Something tells me this is what inspired Pokemon with the breeding monsters bit. So..,is this a mix of FF, Golden Sun and Pokemon? If so I may just get it...but was hoping for Terranigma to be released too one day.